You switched to our site for Czech Republic. Ready-to-use solution for configuring test sequences by remote control. For all standards supported by the R&S®CMW family. For general RF testing, preconformance and superior user experience test scenarios. Today the R&S®CMW500 - Production Test is the leading, most popular multistandard platform for UE testing. It is used by network operators, test houses, handset vendors and chipset manufacturers alike. Today the R&S®CMW500 - Production Test is the leading, most popular multistandard platform for UE testing. It is used by network operators, test houses, handset vendors and chipset manufacturers alike. The R&S®CMWrun automation software meets all requirements for executing remote control test sequences on the R&S®CMW500 - Production Test in R&D, quality assurance, production and service for both current and future wireless equipment. 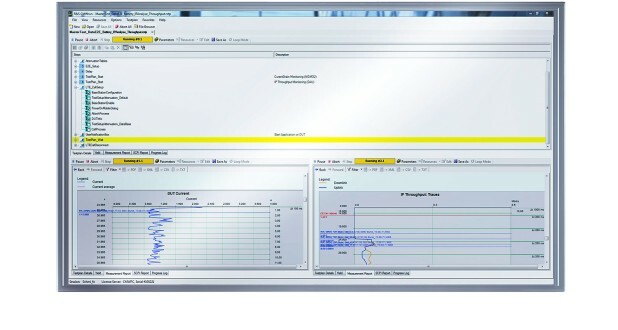 The software engine is based on the execution of test DLLs (plug-in assemblies). This architecture allows easy and straightforward configuration of test sequences without requiring specific programming knowledge of how to remotely control the instrument. It also provides full flexibility when configuring parameters and limits for the test items provided in the standard-specific R&S®CMWrun package options.